Few subjects elicit stronger responses than the relationship between science and religion. How best to characterize this relationship? According to recent historical work, “No generalization has proved more seductive and tenacious than that of ‘conflict. '” Such generalizations, or assumptions, are widely prevalent in contemporary culture. In popular press, in journalism, and even among some academic circles, science and religion are either portrayed as engaged in warfare, or that their relationship is one of mutual independence. Historians for some time now have questioned this “conflict” or “warfare” metaphor. In its place many recent historians have promoted what has been called the “complexity thesis,” the idea that individuals of the past did not think of the relationship between science and religion as a simplistic matter of conflict or concord, but rather exhibited diverse patterns of understanding. This message is reinforced in two books I have read this past week. The first is an earlier volume by David C. Lindberg and Ronald L. Numbers (eds. ), God and Nature: Historical Essays on the Encounter between Christianity and Science (1986) and, more recently, and which has been quipped as the “Son of God and Nature,” their When Science and Christianity Meet (2003). Both books distance themselves from the warfare metaphor by providing case studies, ranging from “science and the early church” to “the Scopes Trial in history and legend,” that clearly demonstrate the complex—and often positive—interaction between science and religion. These studies are excellent history, correcting many past distortions, and can provide the basis for future scholarship. 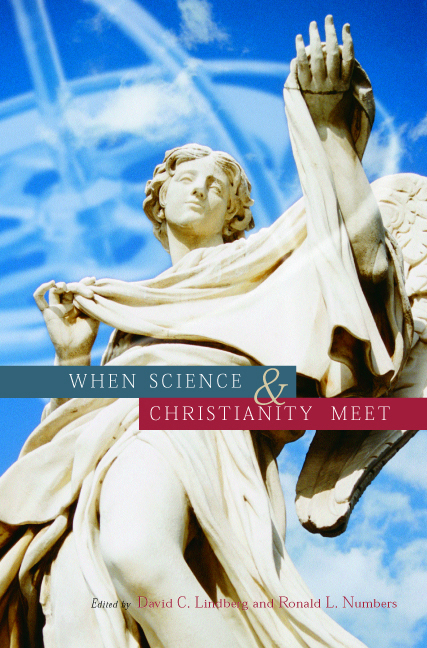 Although published more than twenty-years ago, the essays “Science and Religion” (1985) and “Beyond War and Peace: A Reappraisal of the Encounter between Christianity and Science” (1986), written by Ronald L. Numbers and David C. Lindberg respectively, still serve well as introductions to the science-religion debate; and particularly well in introducing to the reader the figures John William Draper (1811-1882) and Andrew Dickson White (1832-1918). Both authors focus more on A.D. White, for “no work—not even John William Draper’s best-selling History of the Conflict between Religion and Science (1874)—has done more than White’s to instill in the public mind a sense of the adversarial relationship between science and religion.” Indeed, White’s two-volume History of the Warfare of Science with Theology in Christendom (1896) not only remains in print today, but has been translated into German, French, Italian, Swedish, and Japanese. In all modern history, interference with Science in the supposed interest of religion—no matter how conscientious such interference may have been—has resulted in the direst evils both to Religion and Science, and invariably. And on the other hand all untrammeled scientific investigation, no matter how dangerous to religion some of its stages may have seemed, temporarily to be, has invariably resulted in the highest good of Religion and Science. Having forayed into the complexity of the history of reading and publishing, we now return to the remaining chapters in Thomas Dixon et al., Science and Religion: New Historical Perspectives (2010). Noah Efron’s essay, “Sciences and Religions: What it means to take historical perspective seriously,” pays personal tribute to the influence of John Hedley Brooke. Efron discovered Brooke as a young historian, forcing him to rethink what he understood then about science-religion relations, gleamed from the pages of Robert Merton, Ian Barbour, Andrew Dickson White, and others. From Brooke he learned that the real lesson from science-religion relations turns out to be “complexity,” and to abstract these categories from their historical contexts leads to “artificiality as well as anachronism.” What Brooke achieved, according to Efron, was a de-reified science and religion. This was of lasting consequence for anyone seeking to understand the engagements of science and religion. First, it becomes impossible for the historian to sympathize with projects aimed at uncovering some essence of “science” or “religion,” and, therefore, some timeless, inherent relationship between them. Further, the engagements of science and religion can only be understood by attending to context, which includes the historical, cultural, social, political, economic, and more. Further still, a new emphasis on individuals, rather than ideas of individuals, takes precedence. More recent studies on Isaac Newton, for example, have demonstrated the complicated integration of his natural philosophy with the uniqueness, idiosyncratic, heterodox, and oddity of Newton’s theology. Sophisticated and sympathetic readings of published and unpublished historical documents; a palpable delight in the richness and intricacy of intellectual histories; a rhetorical style which manages to convey caution and modesty at the same time as a certain steely resolve: this is the impression Brooke’s writings have on a reader. But Brooke’s emphasis on complexity can bring out a radically pluralistic historiography. If there is no single “relationship between science and religion,” if each faith tradition has encountered the sciences in very particular ways, and if neither “science” nor “religion” has even had a stable meaning across time, then it become extremely difficult for a discussion to take place about common experiences and shared concerns. After all, master-narratives allow some lessons or morals to be drawn from accounts of the past; by contrast, the sort of “complexity” advocated by Brooke, focusing on the historically specific, the contingent, the unique, the sui generis, does not encourage such easy moralizing. Indeed, it may “demoralize,” in the literal sense of removing the “moral of the story” from history. On the one hand, it may indeed invalidate polemical uses to which the history of science and religion has so often been put, namely by Richard Dawkins, Daniel Dennett, but also by Rodney Stark and Chris Hedges, and others; but, on the other hand, by historicizing science-religion relations, it “provides neither aid nor solace” to religious believers as well. Brooke’s method leaves little to the imagination, leaving many feeling emotionally and intellectually unsatisfied because “complexifying history seems to have little to recommend it besides its truth.” We need themes and patterns and Brooke’s method leaves us with neither. Ron Numbers seeks to redress the balance in his essay, “Simplifying Complexity: patterns in the history of science and religion.” In this essay he identifies five mid-scale patterns, or mid-scale generalizations, that can be used to understand trends in the relationship between science and religion: naturalization, privatization, secularization, globalization, and radicalization. Naturalization refers to the rise of methodological naturalism in the late eighteenth and early nineteenth centuries. The supernatural could no longer have any part in science and no scientist today, religious believer or not, thinks “divine agency” in scientific practice is a good idea. In the final essay of this volume, Geoffrey Cantor’s “What shall we do with the Conflict Thesis?” shows how the conflict thesis can be reconceptualized if we concentrate on what happened within the minds of individual religious believers grappling with new scientific discoveries. Using the example of eighteenth-century Dublin Quaker, physician, and naturalist, John Rutty (1697-1775), we see a man “assailed by inner conflict as he was repeatedly pulled between the opposing poles of the pursuit of science and of the pure spiritual life.” The case of Rutty, Cantor explains, raises two important issues. First, looking at sources such as diaries and letters make visible certain aspects of science-religion relations that rarely find expression in published work. And second, such sources manifest one specific form of conflict between science and religion. Rather than some meta-narrative of conflict, the case of Rutty clearly shows an inner conflict in trying to be both religiously pious and a man or woman of science. What is more, the old, tired conflict thesis has never been a homogenous category, and has never had a consensus over precisely the nature of “conflict” involved. Was the conflict between science and religion epistemological, in the sense of conflicts between the worldviews of science and religion? Or does it involve different methodologies? Is it a conflict over values and applied science? Or does it reflect social conflict between competing groups of authority, as was the case between scientific naturalists and the Established Church in Victorian Britain? The contingency of conflict, rather than the necessity, therefore, cannot be emphasized enough. In marked contrast to recent research, the traditional conflict thesis posits a necessary conflict. It is a master narrative which portrays science as inevitably pitted against religion, because of some essential difference between the two. Classic versions are found in John William Draper’s History of the Conflict between religion and science (1875) and Andrew Dickson White’s A History of the Warfare of science with theology in Christendom (1896). According to Cantor, “throughout the ensuing century this thesis has become part of our general culture, and it continues to be repeated ad nauseam in the popular media and even on academic contexts.” Although recent researches of historians have demonstrated “the immense diversity and complexity of the issues and arguments used by historical actors when discussing matters of science and religion,” the conflict narrative continues to prosper. Individuals try to make sense of their experience, which for each individual includes knowledge or beliefs concerning many diverse aspects of both religion and science. Individuals may perceive tensions within religion…and also within their view of science. Moreover, conflicts, tensions, dissonances, or whatever you want to call them are likely to occur between a person’s understanding of science and of religion. Historical actors who recognize these tensions will often try to minimize them (especially if the tensions lead to distress), one strategy being to frame a relevant problem for which a solution can be sought. In addressing how internal conflicts morph into public controversy, Cantor examines the case of John William Draper. Following Festinger once more, he argues that one way to reduce dissonances is to reject compromise and instead try to convince others of the correctness of one’s own system. An example of this is found in Draper’s historical writings. As one of the first books to be structured on the idea of a preordained and necessary conflict between two opposing worldviews, Draper’s three-volume History of the American Civil War (1868-70) attributed the war to two hostile groups of states, the North and the South, the former being committed to freedom, the latter to slavery. This book was published only a few years before the publication of his more well-known History of the conflict between religion and science, this time postulating a preordained and necessary conflict between science and religion. Furthermore, Draper History of conflict “appeared very shortly after John Tyndall’s famous presidential address before the British Association in Belfast, for which Tyndall was widely criticized for endorsing materialism and therefore atheism.” The close temporal connection between Tyndall’s address and Draper’s back-to-back narratives of conflict makes one wonder whether individual psychology as well as social history needs to be employed in an explanation of the origins of our ideas of a conflict between science and religion. Developments in both science and religion during the third quarter of the nineteenth century conspired to give the discourse of conflict a far higher cultural profile, extensive popularity, and social legitimacy than all the David Humes, Baron d’Holbachs, and Thomas Paines of the previous century. This is but one course of conflict. More commonly, as in the cases of Nicolas Copernicus (1473-1543), Tycho Brahe (1546-1601), Francis Bacon (1561-1626), Galileo Galilei (1564-1642), Johannes Kepler (1571-1630), Rene Descartes (1596-1650), Robert Boyle (1627-1691), and Isaac Newton (1642-1727), conflict and tensions, far from undermining religion, is necessary for its intellectual development. Continuing the discussion from the previous post, Cohen’s tenacious assumptions about creationism and the Scopes trial undoubtedly arises from the notion that the movement is geographically contained. His examples of Tennessee, Alabama, Florida, Oklahoma, and Texas are no accident, and the underlying political assumptions are plain. But as Ron Numbers has made quite clear in a number of works, creationism has spread—and is spreading—beyond the confines of the United States. According to Numbers, during the century or so following the publication of Charles Darwin’s Origin of Species (1859) most conservative Christian antievolutionists accepted the evidence of the antiquity of life on earth while rejecting the transmutation of species. Only a small minority, founded largely among the Seventh-Day Adventist followers of the prophet Ellen G. White (1897-1915), insisted on the special creation of all life forms 6,000 to 10,000 years ago and on a universal flood at the time of Noah that buried most of the fossils. In the 1960s, there was something of a “creationist revival” taking place in America, led largely by the Texas engineer Henry M Morris (1918- ). A thorough study of the Bible following graduation from college convinced him of its absolute truth and prompted him to reevaluate his belief in evolution. In the late 1950s, he began collaborating with theologian John C. Whitecomb Jr. (1924- ). While working on a book project together, Morris had earned a PhD in hydraulic engineering from the University of Minnesota and began chairing the Civil Engineering department at Virginia Polytechnic Institute. In 1961 they published The Genesis Flood, the most comprehensive contribution to strict creationism since the 1920s. 1963 they established the Creation Research Society (CRS). Of the 10 founding members, five possessed doctorates in biology; a sixth had earned a PhD degree in biochemistry; and a seventh held a master’s degree in biology. New societies would continue to spring up in the 1970s, in the form of Creation Science Research Center (CSRC) and the Institute of Creation Research (ICR), which, according to Morris, would be “controlled and operated by scientists” and would engage in research and education. This new brand of creationist did not appeal to the authority of the Bible. Rather, they consciously downplayed the Genesis story in favor of what they called “scientific creationism.” In short, they competed for equal scientific status. And unlike the anti-evolution crusade of the 1920s, which remain confined mainly to North America, the revival of the 1960s rapidly spread overseas. By 1980, Morris’s books alone had been translated into Chinese, Czech, Dutch, French, German, Spanish, Japanese, Korean, Portuguese, and Russian. Strict creationism was becoming an international phenomenon. Few countries outside the United States gave creation science a warmer reception than Australia. Morris had visited Australia in 1973, inspiring Ken A. Ham to organize the Creation Science Foundation (CSF) in Brisbane, quickly becoming the center of antievolutionism in the South Pacific. Elsewhere in Western Europe creationists were making similar inroads. A poll of adult Europeans revealed that only 40% believed in naturalistic evolution, 21% in theistic evolution, and 20% in a recent special creation, while 19% remained undecided or ignorant. The highest concentrations of young earth creationists were found, remarkably, in Switzerland, Austria, and Germany. In Italy antievolutionists formed a society in the early 1990s dedicated to introducing “into both public and private schools the biblical message of creationism and the scientific studies that confirm it.” Most Italian academics ignored the threat until early in 2004, when the right wing political party began dismissing evolution as a fairytale unlinking Darwinism to Marxism. Almost immediately after the fall of the Berlin wall in 1989 and the dissolution of the Soviet Union two years later, conservative Christians began to flood the formerly communist countries of Eastern Europe. Within a few years creationist missionaries had successfully planted new societies in Poland, Hungary, Romania, Serbia, Russia, and the Ukraine. After a very slow start in Latin America, creationists witnessed an explosion of interest, paralleling that of evangelical Christianity generally. According to a survey taken in Brazil in 2004, 31% of the population believed that “the first humans were created no more than 10,000 years ago” and the overwhelming majority favored teaching creationism. In Asia, Koreans emerged as a creationist powerhouse, propagating the message at home and abroad. In the 1980s creationists established the Korea Association of Creation Research (KACR), and by 2000 its membership stood at 1,365, giving Korea claim to being the creationist capital of the world. But it’s not merely Christians who are creationists. According to Numbers, in the mid-1980s the ICR received the call from the Muslim minister of education in Turkey, saying that “he wanted to eliminate the secular-based, evolution only teaching dominant in their schools and replace it with the curriculum teaching the two models evolution and creation.” In 1990 a small group of young Turks in Istanbul formed the Science Research Foundation (BAV), dedicated to promoting “immaterial cosmology and opposing evolution.” Also, in 2000 a group of Jewish antievolutionists in Israel and United States formed the Torah Science Foundation (TSF), whose head member, a professor of ecology and evolutionary biology at the University of California, Los Angeles, advocates “Kosher evolution,” that is, accepting microevolution while rejecting macroevolution. Contrary to almost all expectations, geographical, theological, and political, “civilized opinion” has failed to contain what had begun as a distinctively American phenomena. Evidently, creationism is not merely a Southern predilection.